Central Yharnam is an upper-class district located in the center of the city, an area characterized by bridges and large streets. Central Yharnam is separated from the rest of the city by a cliff. An ancient cathedral is located in the area. The district is also home to a medical association that oversees the use of the "curative blood". 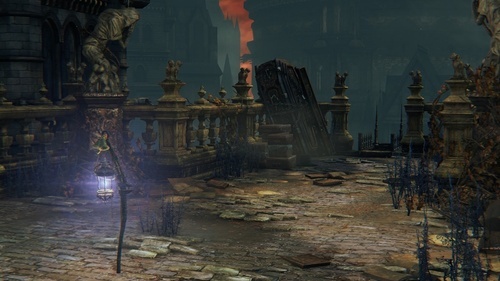 Interestingly, while the player is in Yharnam and the Cathedral Ward they can sometimes hear the sound of a distant thunderclap. This sound effect is exactly the same as the one used in the Fishing Hamlet and what is so odd about this is that stormy weather never rains over Yharnam, so a thunderclap sound effect has no business being there, whereas the Fishing Hamlet is constantly in a deluge indicating that the thunderclap is being heard from the Fishing Hamlet; as if across realities. This in some way seems to link the reality of Yharnam with that of the Hunter's Nightmare and more specifically, the Fishing Hamlet.